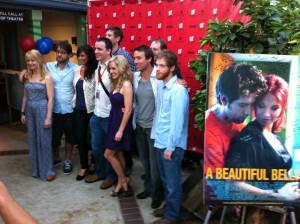 L to R: Michele Feren, Chris Worley, Lauren Brown, Andrew Kenneth Gay, John William Wright, Amy LoCicero, Peyton Lee, Jon Friskics (sound designer), and Marco Cordero. Well, the Florida Film Festival has come and gone, and with two great screenings under our belt, I’m pleased to say our premiere was a huge success. The story is beautifully set to the music of Jason Kupfer of The Pauses, though the silent spans of the movie provide a thoughtful intensity to the depth of the characters’ actions and thoughts. Chris Worley, in his debut film, portrays Jason with passion and anguish alongside the talented cast. An emblematic and true-to-life piece, UCF Department of Film Interim Chair, Steve Schlow poignantly stated at the premiere that the director had indeed “climbed a mountain” with the making of this film. No relationship is perfect, but the moral of this story seems to be that if there is enough love between two people, then “anything is possible.” Bravo Andrew, A Beautiful Belly is a beautiful movie. I’m extremely proud of my cast and crew for bringing this film to fruition and thankful to the Florida Film Festival for selecting us to premiere at this year’s festival. We had a great time! We’ll see you at the next fest soon (we hope)!